This shower curtain inspires me to redecorate my bathroom. I have a very standard 6' x9' bathroom with a tub/shower combo, nothing fancy. In fact many of you probably have the same functional bathroom. 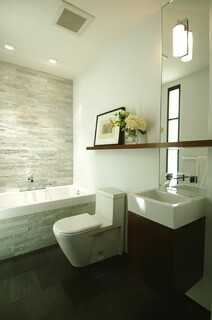 I know that I will never have a bathroom like the incredible ones featured in Houzz and other online sites. So the shower curtain matters. I love this dynamic design combined with a rich color. 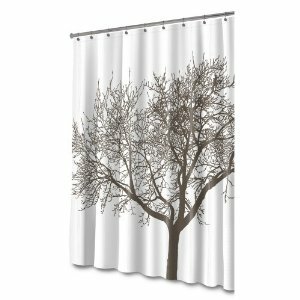 I can see my bathroom with standard white fixtures painted a mocha brown to match the tree and big fluffy white towels offset against the rich background. It would be stunning and still have plain vanilla bones. I have redone my bathroom several times in the 32 years we have lived here. It is the easiest room to redo and I can make drastic visual changes without it costing a lot of money. I have learned from experience that you always start with the shower curtain! You can get paint to match any shower curtain. But you can't get a shower curtain to match any paint. An idea that I did pick up on Houz and I might implement if I get truly ambitious is a shelf for beautiful stuff in the bathroom. I like handmade pottery, a dried grasses arrangement, even candles in the bathroom. I especially like how this shelf appears to divide the mirror. It's got me thinking. 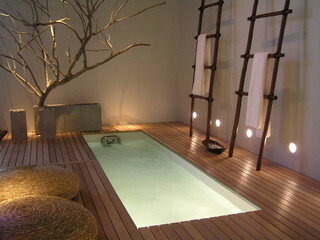 But then if I wasn't being practical, imagine a bathroom based on this design also from Houzz? The branch is so very dramatic.